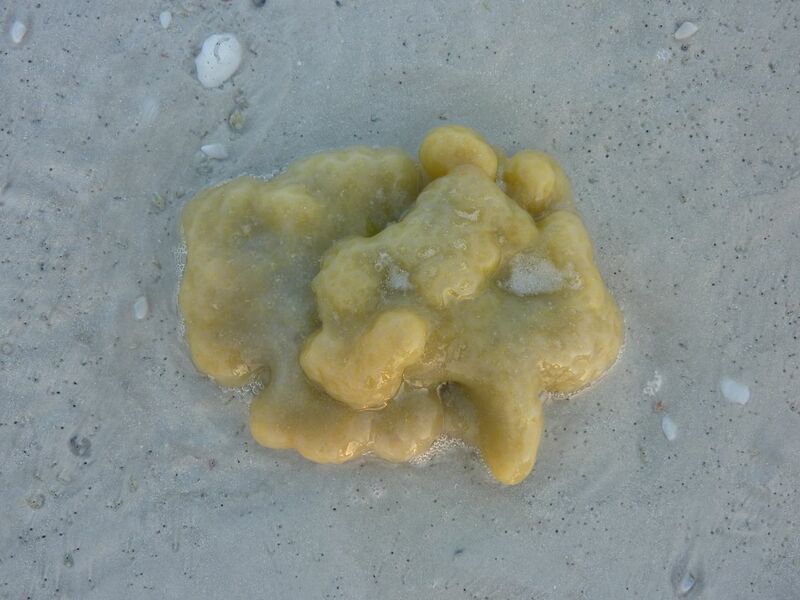 What is this Stuff on the Beach? 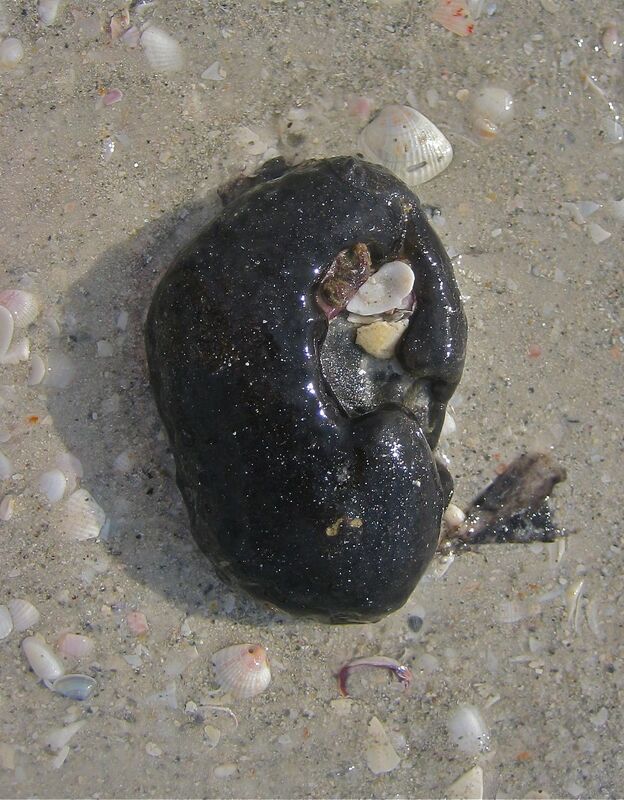 Is it an organ of a marine animal on the beach? Is it a tar ball that got washed up on the beach? Is it the beginning of another attack of The Blob? Nope, it is Sea Pork. 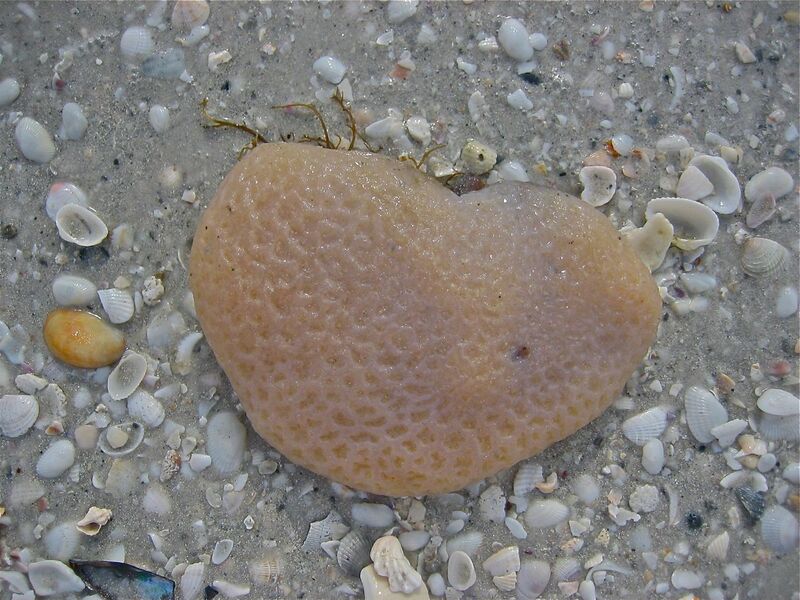 It’s a TUNICATE. They are rubbery globs of cellulose that house tiny zooids that filter seawater as food. Wild! If you want more technical info visit http://www.mitchellspublications.com/guides/shells/articles/0084/ . For me? I just like to look at their weirdness. Have you seen them on the beach too? NextWrite From The Beach GiveAway! LOL! You come up with the best “stuff”! I was in Fort Myers Beach/Sanibel in early August . . . have tons of pictures of these “blobs” . . . had no idea what they were . . . glad to be educated!!! I have always wondered about these things – thanks! Hi Pam…too bizarre! I will have to show this to Fritz, He will be a fan. Lol. He likes any kind of pork…bacon, sausage, yuk:) You Do come up with some Very cool stuff! I’m going to have to start looking for this! Miss you! I can think of lots of things I’d venture to taste for the first time — sea pork has no chance of making the list! Thanks for all the great info, Pam! I think the name “sea pork” makes it sounds more gross than it actually is. I saw a couple of things while there in July – I thought they were some kind of jelly. Thanks for the education. Amen, Sista…no way will that particular item make it on my table, EVER! EEEEEEWW! All your info is so amazing!! And I’m throwing my hands up in surrender….I’ve been to many caribbean beaches and thought I’d seen so many shell islands, but nah. 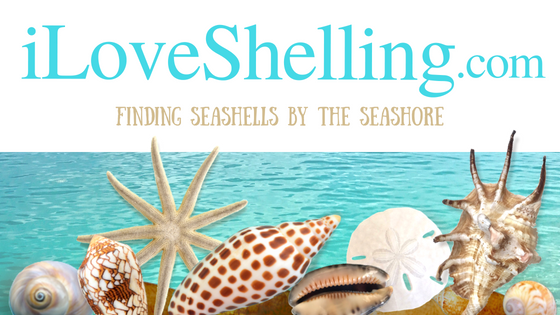 I’ve never seen the amount and different kinds of shells that you guys find where you are!! I have got to come to your neck of the woods soon!! Yes! LOL of course I had to. If the sea pork contains a group of organisms does anyone know whether it is dead or alive when it washes up on the beach ? Should we be throwing it back in? My son gathered up a ton of it and put it together then took pictures..it was beautiful actually…but the question is, did he then harm all those tiny guys? We found a huge one on the north side of Captiva just a few days ago. (Mar. 2012) It was covered except for the size of a quarter but had seaweed on the top so I thought it was a carrot that had been buried. As we started digging it up, it was about 10 lbs and a foot by a foot by 4″. We had no idea what it was. Thanks for the information. 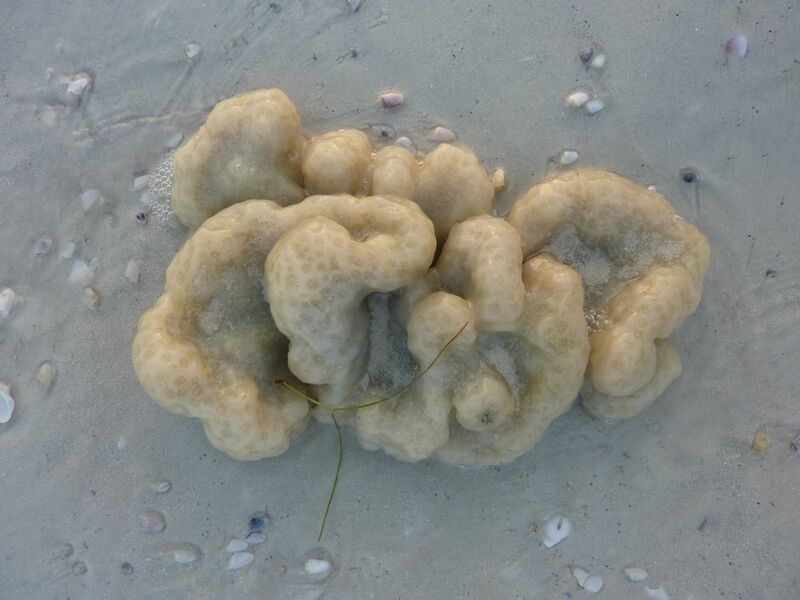 Thank you so much for identifying ” sea pork brainy” . I saw lots of this on the beach of Oak Island, NC during a recent visit. I did several web searches to no avail. Now I know what it is.Love your site. I saw all of those except the black and brainy. Still have few days left, so maybe! I can’t believe all the sea items I have found and either taken or photographed. SO much fun. We live on Cape Cod in the summer and have seen nothing like this. 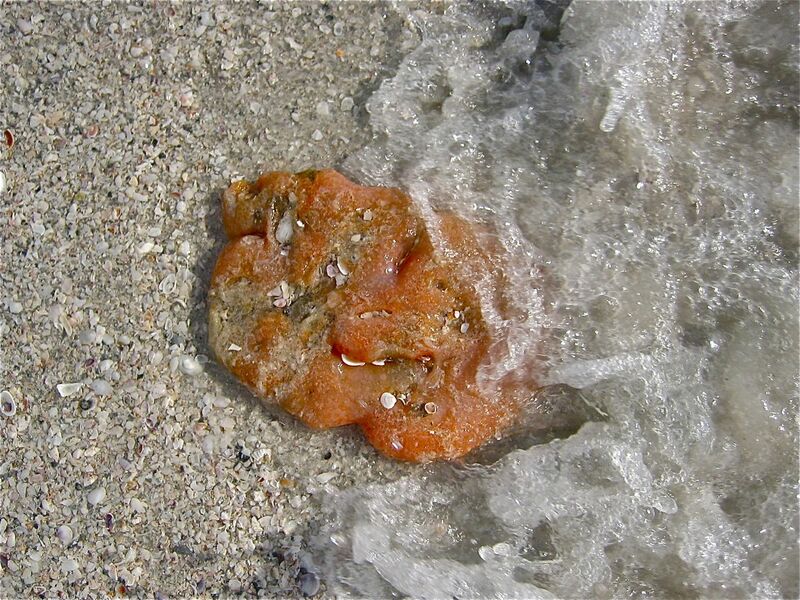 Wondering what the various shades of orange, soft stuff that looks like coral, is and can it be preserved. very interesting! I wondered what this alien-looking creature was for the last 3 years here vacationing each January at Redington Shores. Thanks for the info! We mostly get it washing up in the grey and orange colours! Me and my family went to marco island this spring break. 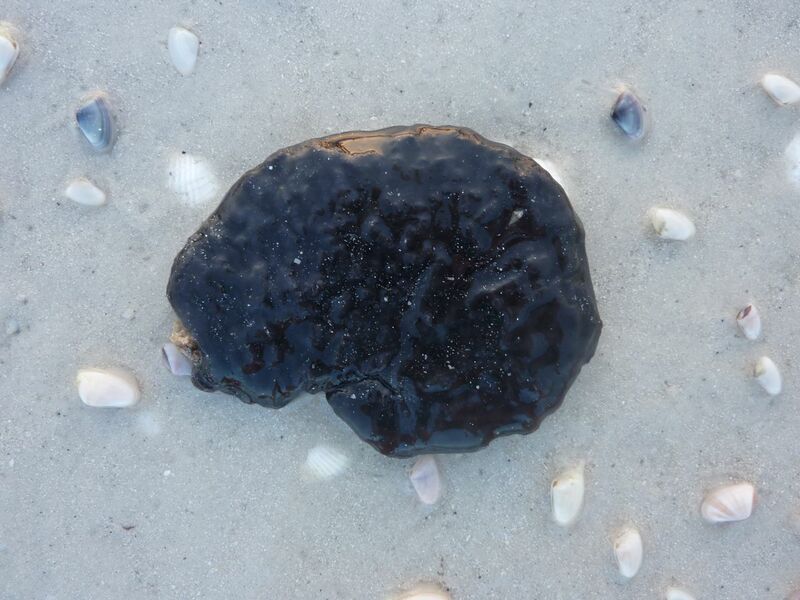 We were playing in the water and all of the sudden this weird purple blob thing washes up on the beach! We weren’t sure what is was so we kept it on our hotel deck to try and dry it out. Later that day it started raining and it was our last day. My family told me to put Fred back (I named him Fred) so I did. I never knew what he was until now so thanks I have been VERY curious, BELIEVE ME!!!! Cool! Wondering what it was! I thought maybe it was a colony of Red Tide? or possibly some marine life organ. 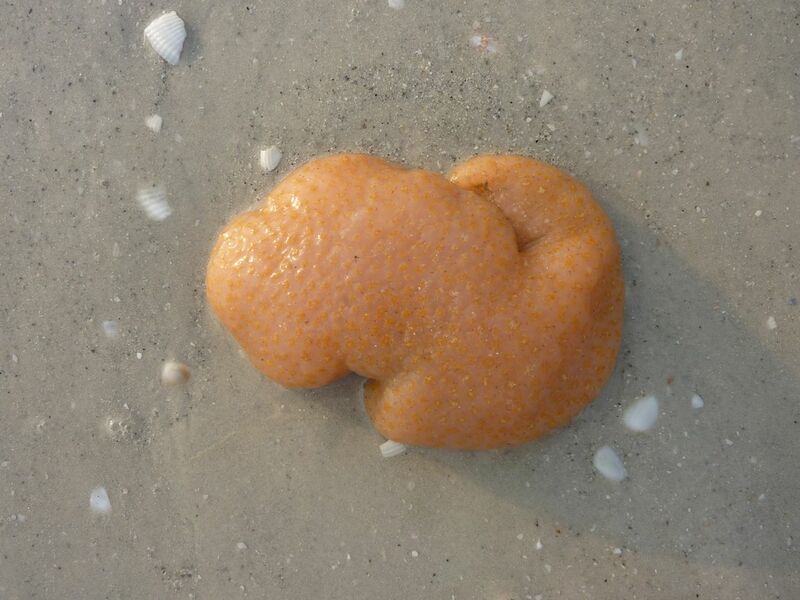 Found some of this at Coquina Beach Fl. today! One colony was about 8 inches diameter! I didn’t have a stick to poke it with (j/k) so felt it. Pliable hard/soft rubbery feel. Pretty color pink. Had whitish coral type circles within it’s membrane. Hehehe! I did think about the blob lol! Thank you for posting this and letting us know! Wish I had taken pictures of it! There was a lot of it today at North Myrtle Beach! I thought it was super weird! Weird enough that I googled “What’s that pink glob on the beach?” It was the color of shrimp when cooked, sort of pink, white, and red marks.